Fresno State’s Arne Nixon Center for the Study of Children’s Literature and the San Joaquin Valley Writing Project will present a writing symposium for teachers and credential students. 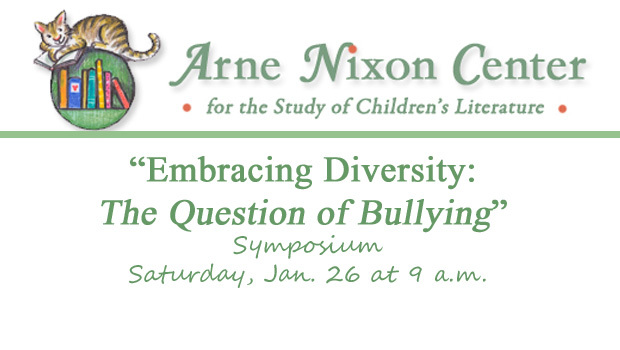 “Embracing Diversity: The Question of Bullying” will be held 9 a.m., Saturday, Jan. 26, at Fresno State’s Education Building, Room 140. Registration deadline is Jan. 14; cost is $20, including box lunch. Two morning plenary presentations will feature bestselling author Alexis O’Neill and author/speaker/blogger Lee Wind. O’Neill, a former elementary school teacher with a Ph.D. in Teacher Education, will share insights on her “bully” book, The Recess Queen, and suggest other titles that promote inclusion and peace on the playground. Wind, who holds an M.A. in Education and Media from Harvard, will lead a discussion exploring classroom action points and ways to transform victims, bullies, and bystanders into students who can celebrate diversity within themselves and their communities. Attendees can choose one of three afternoon workshops, aimed at different grade levels (elementary, middle and high school), providing hands-on activities to encourage critical thinking and promote effective writing skills. The use of library resources, including the LGBTQ (Lesbian, Gay, Bisexual, Transgender, Questioning/Queer) collection, located in the Arne Nixon Center, will be addressed in the workshops. “Embracing Diversity” is the second of three symposia to educate teachers and credential students on current topics in children’s and young adult literature and to assist them in their efforts to improve student writing. The final symposium, “New Perspectives through Illustration and Visual Literacy,” will be held on Saturday, May 11, coinciding with the Nixon Center’s illustration exhibition, “Golden Threads: Journey Through the Picture Book” at Fresno State’s Henry Madden Library, Leon S. Peters Ellipse Gallery March 18 – May 27. The first 40 teachers to register will receive a copy of Alexis O’Neill’s picture book, The Recess Queen. For more information: email Kathee Godfrey at kgodfrey@csufresno.edu or call the Arne Nixon Center at 559.278.8116.